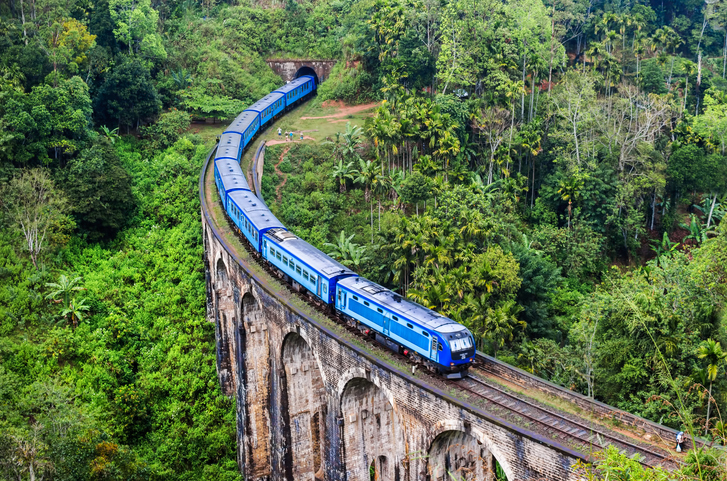 Traveling by train is slower than flying, but you get to see the countryside as you go along. A train of fans followed the pop group along the street. The train of the bride's dress swept along the floor behind her. Erika will be training all the staff to use the new software next week. Adam trains for at least an hour every day. The gardener trained the rose along the wall. The photographer trained his camera on the bride and groom. When you train somebody, you are instilling a particular kind of behavior in them, like training a dog not to bark all the time or a child to use the toilet, or you are ensuring they have the skills to do a particular thing, like use a piece of software, perform the necessary tasks involved in a job, or know how to play a sport. Although you could almost always use the word teach in place of train, train differs slightly in meaning, in that it is about teaching someone all the skills they need to do or use something, rather than teaching them a particular subject. It would, therefore, be unusual to use use train when talking about a specific subject; you wouldn’t usually say that you are training someone in math or English, for example. Train, as a noun, dates back to the early 14th century, when it originally meant ‘a delay or drawing out.’ By the mid-14th century, it had also come to mean ‘the trailing part of a dress, cloak or skirt,’ and ‘a retinue or procession.’ It comes from the Old French train, which meant ‘track or path,’ and ‘the trail of a gown,’ as well as ‘the act of dragging.’ It is a noun form of the Old French verb trainer, which was ‘to pull, drag or draw.’ It can be traced to the Vulgar Latin verb traginare an extention of another VL verb, tragere (to pull), which is a variation of the Latin verb trahere (to pull or draw). The sense widened to include ‘a procession, series or succession’ in the late 15th century, and the figurative expression train of thought, which plays on this sense, was first recorded in the late 16th century. The most common use we know, a series of cars pulled by a locomotive, is an expanded use of the idea of a train of wagons, in this sense (a series or procession), and has been used since the early 19th century. The verb dates back to the mid-14th century, and comes from the noun. Its original meaning was ‘to draw out or manipulate something into a desired form,’ and was mostly used for plants. The meaning expanded in the mid-16th century to include ‘to bring to a desired state through instruction’ (in other words, to teach or discipline), and was a figurative use of the former sense. The sense ‘to make yourself fit through exercise’ is a play on the previous sense, and appeared in the 19th century. The meaning ‘to point or aim’ a camera or firearm is also from the 19th century.